Still working on the puzzle titled A Cube of Resistors? I’ll give you a hint. Well, more of a hint, I’ll suggest some guidelines of how a clever method of how to solve it. Don’t read anymore if you want to figure it out on your own. Do not read any further if you don’t want any clues on how to solve the A Cube of Resistors puzzle. Be an Electrical Engineer! Don’t cheat! Alright, here is the hint. The cube has many planes of symmetry. Exploiting them provides a very elegant solution. I decided to redraw the color to illustrate how many resistors are in similar circumstances. There is a symmetry of the puzzle. The different colored zones have similar properties. For example, all the resistors corresponding to the blue lines have a common point, the red one, with the same potential. But, the other end of the blue lines must also have the same potential. Why? Just look further down… there is a symmetry to each line. Follow the path from each blue line to the other end, and you will they look the same. Thus, although technically the blue lines are not in parallel, the symmetry of the cube makes them be in the same potential on both ends so they can be treated as if they were in parallel. A similar argument works for the 6 resistors corresponding to the black lines; they can all be thought as if they were in the same potential difference between their ends. Also, treat the 3 green lines in the same manner, as if they were parallel resistors. Following this argument, the Cube of Resistors will have the same resistance as the following figure. This is not a cube. Yet, it has the same resistance and potential changes as the Cube of Resistors. 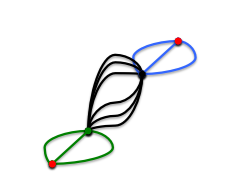 This figure is obtained by collapsing all the points with the same potential in the cube to one. After all, if the have the same potential, you can short circuit them without changing anything, right? Now, this problem is much easier to solve. Treat the blues as 3 resistors in parallel, followed in series by 6 in parallel, followed in series by 3 in parallel. Come on, you can do it! If you want to check your final answer, read ahead. Otherwise, don’t as it will spoil the fun. Do not read any further if you don’t want the answer to A Cube of Resistors puzzle. Correct answer to the puzzle coming ahead. Don’t read any further if you don’t want to know the numerical answer. Where does the number come from? Well, the equivalent resistance of the 3 blue lines as if they were in parallel is 1/3 Ohm (three resistance in parallel can carry three times as much current as one of them on its own. By a similar argument, the equivalent resistance of the 6 black lines as if they were in parallel is 1/6 Ohm. The equivalent resistance of the 3 green lines as if they were in parallel is 1/3 Ohm. Since each color is in series with each other, the resistances add. 1/3 Ohm + 1/6 Ohm + 1/3 Ohm = 5/6 Ohm. Thanks for your interest, C.O.! I’ll delete the comments as requested.